Dr. Peggy Leary earned a degree in pharmacy from UMB in 1975. She then went back to school to get her degree in dentistry and received her D.D.S from UMB in 1979. Soon thereafter she entered into a private practice in Bel Air, Maryland. 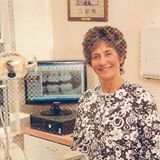 In 1994, she established her own practice and has been practicing general dentistry for over 30 years now. Dr. Leary is a member of the American Dental Association, the Alpha Omega, and the Greater Chesapeake Study Club. She continues to enhance her career by actively pursuing her continuing education in the various fields of dentistry. Dr. Leary’s husband, Charlie Leary, is a retired Pharmacist and together they have two children, Erin and Brian. She enjoys reading, working out at the club, needlework, and going to the beach in her spare time.